By Xah Lee. Date: 2016-05-09 . Last updated: 2018-01-30 . 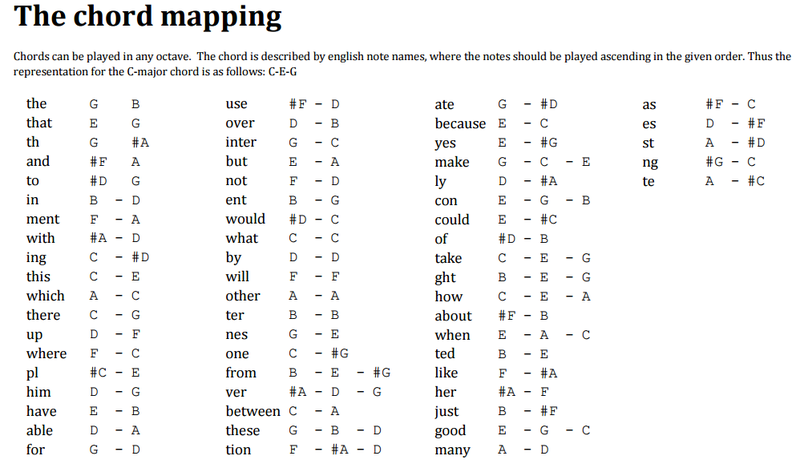 Of my 10+ years obsession studying keyboard efficiency, including steno, i think nothnig beats using piano for typing. Inspired by the high keying rates of skilled pianists, we study the design of piano keyboards for rapid text entry. We review the qualities of the piano as an input device, observing four design opportunities: ① chords, ② redundancy (more keys than letters in English), ③ the transfer of musical skill and ④ optional sound feedback. Although some have been utilized in previous text entry methods, our goal is to exploit all four in a single design. 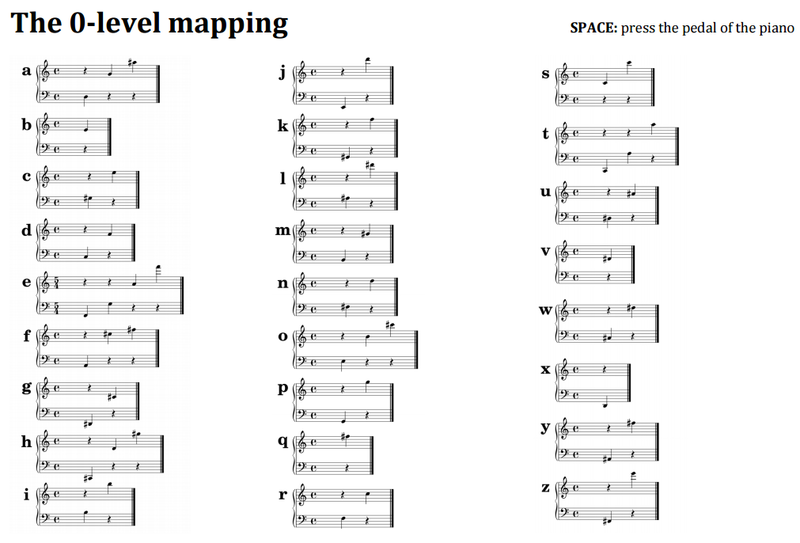 We present PianoText, a computationally designed mapping that assigns letter sequences of English to frequent note transitions of music. It allows fast text entry on any MIDI-enabled keyboard and was evaluated in two transcription typing studies. Both show an achievable rate of over 80 words per minute. This parallels the rates of expert Qwerty typists and doubles that of a previous piano-based design from the 19th century. We also design PianoText-Mini, which allows for comparable performance in a portable form factor. Informed by the studies, we estimate the upper bound of typing performance, draw implications to other text entry methods, and critically discuss outstanding design challenges. The learning time required to achieve 80 word per minute is less than learning touch-type on QWERTY keyboard. And, the learning time to achieve 200 wpm seems comparable to Stenotype Machine. You can download software to try it. If you never had a music keyboard before, here's a introduction. For a basic MIDI keyboard at a price range of a cheap mechanical keyboard, this one is best seller on amazon. Good reviews. Only 6.7 pounds (3 kg) shipping weight. Note, the above is a MIDI keyboard controller. It doesn't have any sound by itself. you can go for more pro, but gets expensive. Compact. Ideally, not much extra space behind keyboard. No speakers, or just tiny one. If you are serious about using piano keyboard for typing, i only recommend the pro stuff. 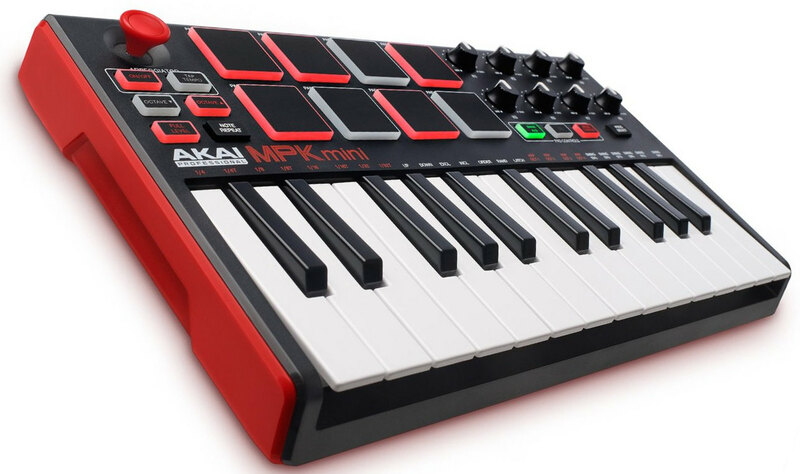 Get MIDI controller such as the above, or synth keyboard. Don't buy the consumer stuff. Because, the key mechanism of a piano keyboard or digital/synth keyboard is a HUGE DEAL , far bigger deal than computer keyboard mechanism. You want a piano keyboard that you can type for long, can feel it, control the key velocity (expressiveness), etc. Your hand will get tired if you use cheap consumer keyboard of few hundred dollars. I would actually just recommend you buy a “MIDI Controller” for typing. That is, when you search amazon, just search “MIDI Controller”. MIDI Controller is just a keyboard dedicated as a input device. It is meant to connect to a synthesizer to actually create sound or perform. MIDI Controller is particularly suited for use as typing, because it is actually a dedicated device for it. You pay for the quality key and mechanism only. If you want sound or actually learn music, i recommend that being a separate process. The one i recommend above, the: M-Audio keystation 49 MIDI keyboard Buy at amazon, is actually perfect. Cheap, small, light weight, just right for our purpose. here's some video and articles about how to turn a midi keyboard to type text. These articles are not related to the above.